Item Specifics are attributes or details about a particular item you are selling (e.g., type, style, main color, material, brand, etc.). Depending on the eBay category the item is being listed to, some item specifics are required by eBay, and some are just recommended to provide extra information. Item Specifics inform potential buyers about the product, and will help them search for your listing as well. Some Item Specifics fields apply to channels other than eBay, so they are located in the General section of the Editor. These fields are: Size, Color, Condition, Style, Brand, and UPC. After you input a category in an eBay section of the Editor, Suredone will display the remaining Item Specifics associated with that category in the Item Specifics section. 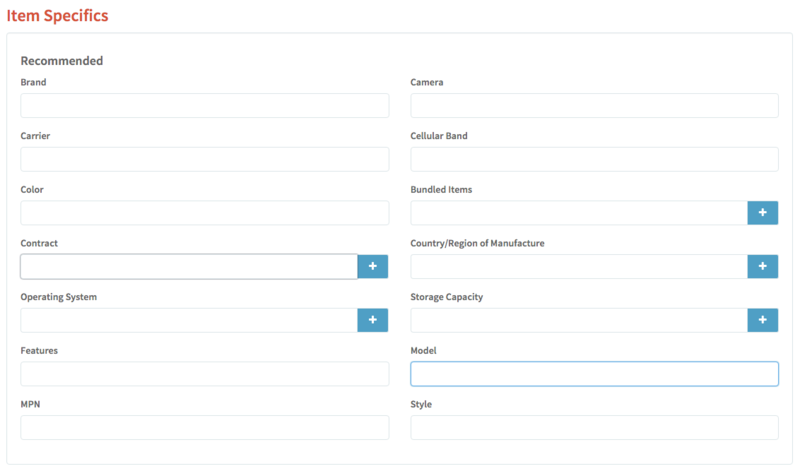 The Item Specifics fields shown vary depending on the value in the Category field. 1. Create a new product (Products > New Product) or select an existing product to edit (Products > All Products). 2. In the eBay section, enter a value in the Category field. Once this is entered, an Item Specifics section will appear beneath the eBay section where you entered the Category field. For more on eBay categories, read our How To: Select Your eBay Category guide. Note: There are fields with blue (+) buttons on the right side, and there are fields without (+) buttons. The fields without (+) buttons already have a custom user field created and associated with them. The fields with (+) buttons do not yet have custom user fields created for them yet. 3. 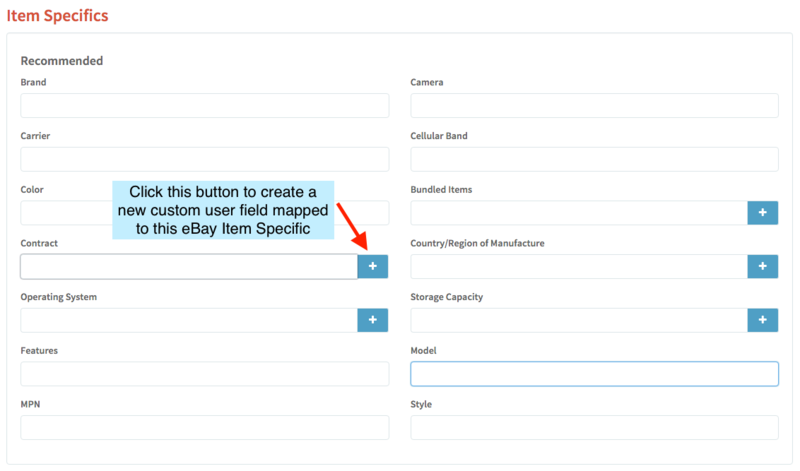 In order to create a new custom user field and map it to an eBay Item Specific, simply click the blue (+) button on the right side of the Item Specific field you would like to have a custom user field. SureDone will automatically create a custom user field and map it to that eBay Item Specific.